The realities of the homeless animals in the story are haunting, bringing to center stage the plight of dogs and cats who don’t have forever homes. 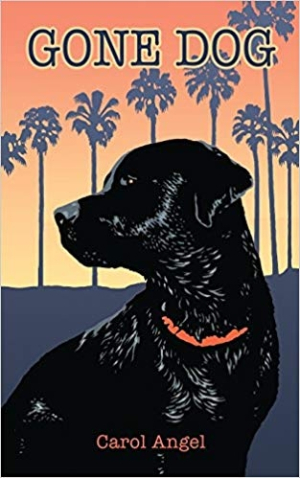 Puppins, a Labrador retriever, narrates his extensive journey of self-discovery in Carol Angel’s young adult novel Gone Dog. Puppins has a unique problem: his memory was wiped clean after he was struck by a car. He cannot remember his past, and he doesn’t know why random sayings and verses pop into his head, but he is relatively content with his present. An animal lover and workaholic, Kristin has taken him in and provided a nice, but rules-heavy, home. Problems start when Kristin’s best friend Jodi introduces her new Irish setter, Ruby. Puppins develops an instant, hopeless crush on Ruby. Unfortunately, not only is Ruby uninterested in Puppins, she values freedom above all else, and she escapes Jodi at the first opportunity. Puppins is crestfallen and keeps an eye out for the emancipated Ruby. When she happens by his yard, Puppins jumps the fence to track her down but finds her indifferent to his presence and mocking of his effort to keep up. Plus, life on the streets is more than he bargained for. When Ruby ditches Puppins once again, he is unclear if he wants to return home or find her. Taking comfort in friendships with the other dogs he meets, he goes with them to the Tribal Base, an abandoned home frequented by animals and run by Mariah, a wise greyhound. There Puppins learns that Ruby has been captured by a dog-fighting operation or by a puppy mill. He finds his courage at last and leads a crusade to free Ruby. The story starts out strong, with Puppins describing his unique background. Short, snappy chapters keep the pages turning, and Puppins’s familiar, fun, conversational tone engages. The random quotes that pop to his mind are intriguing at first, but in their sheer volume, they soon lose their depth. Conversations between Kristin and Jodi become pedantic, channeling unsubtle messages to the audience about not abandoning pets, setting humane traps for feral animals, and following the right steps when taking in a lost animal. After Puppins’s escape, the complexities and life-threatening circumstances of homeless animals are depicted in a well-imagined and highly populated world. However, Puppins’s uncertainty about his goals saps suspense and intensity from an otherwise promising setup. His whining over Ruby is overwhelming; he is perpetually wounded by her sarcasm, no matter how tongue-in-cheek her observations are. Cleverly named dogs and cats with specific strengths and traits enter the story as their skills are needed, but many have the same speaking pattern. Dialogue often includes strings of repeated words connected by ellipses. After much buildup, a major complication is resolved quickly when the dog pack flawlessly executes a plan to bring down hardened criminals who’ve terrorized the neighborhood for years. Afterwards, Puppins, who has tried repeatedly and desperately to win Ruby’s love and prove he is not a wimp, inexplicably loses his concern and determination to find Ruby and declares that it is time to go home: “No more detours.” Still, even that plan is derailed by a new complication. Despite the story’s tendency to digress, dog lovers will still enjoy their time in Puppins’s world. The realities of the homeless animals in the story are haunting, bringing to center stage the plight of dogs and cats who don’t have forever homes. Because of that, Gone Dog achieves its goal.